MyMove makes the company car concept a thing of the past. Build your company's Smart Fleet now! Sunny on Monday? Take the train to work, then cycle home in the evening on a shared e- bike! Cloudy on Tuesday and need to go shopping? Cycle to work, then take one of the company’s green cars to get your groceries on the way home! MyMove helps you build a company fleet with the ideal mix of green cars, bikes, scooters and steps. Your employees then use their personal mobility budget whichever way suits them best. The MyMove app makes it easy to locate, select and unlock vehicles and manage their budget. Any budget left at the end of the year becomes a nice bonus on their paycheck! Company cars are quickly becoming an outdated concept in today’s social and urban landscape. MyMove aims to provide an alternative corporate mobility solution that is both cheaper and greener, while offering your employees all the flexibility they deserve. Let them choose between cars, bikes, public transport and other solutions every day, according to their needs – with zero hassle for them or the company. MyMove is fully digital : no more physical keys to exchange or lose. The MyMove app allows users to lock or unlock all the vehicles. 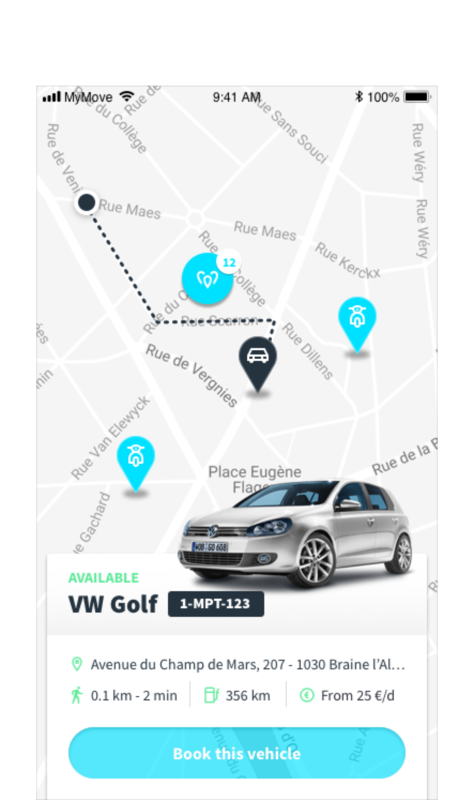 As soon as users want to return vehicles to the company pool, they can simply do it from the app in one tap. Build the perfect Smart Fleet to meet your employees’ needs. MyMove will help you track and manage the best balance of vehicles for your company. How much is the Mobility Budget? How is this cheaper than a personal car? Depending on your usage of the car, the mobility budget can be extremely interesting : if you use your company car only a few times per week but you can go to work by foot, bike, train or public transport, there are good chances that you will be able to save hundreds of euros every month. How do you make sure vehicles are always available when employees need them? 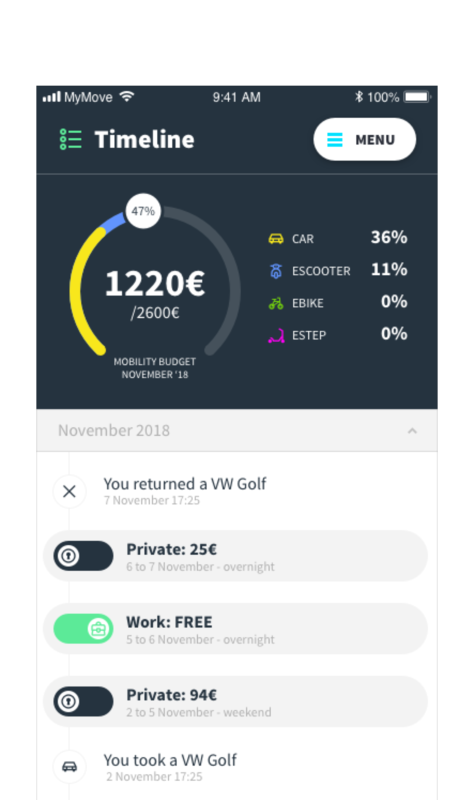 MyMove gives employees the access to an internal shared fleet of vehicles of all types (cars, scooters, bikes, steps) and therefore it is only available to colleagues who have access to a mobility budget. Depending on the needs (both business and private), the fleet manager will define the most appropriate mix of vehicles to offer the best vehicle availability and make sure that the fleet is not underused at the same time. How much does MyMove cost? What about repairs and accidents? How do I get the keys to the vehicle? MyMove is fully digital : no more physical keys to exchange or lose. Every MyMove user gets a digital key that allows him or her to lock and unlock the vehicles. 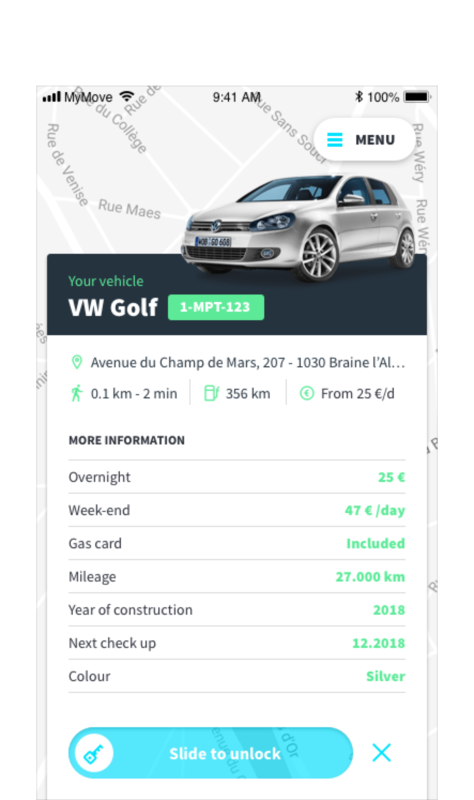 As soon as the user is willing to give back a vehicle to the pool, he can do it from the app in one click. What kind of vehicles do you include? 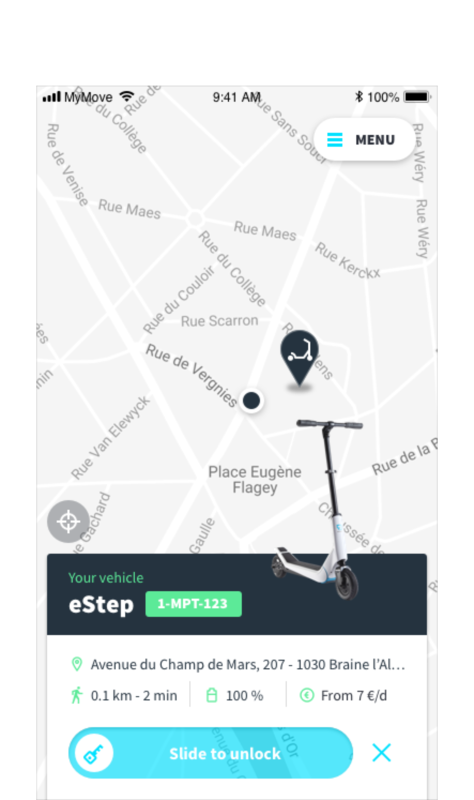 MyMove can offer 4 different types of vehicles : cars, e-scooters, e-bikes and e-steps. Depending on the needs of the employer, the Smart Fleet s will be different from one company to the other. Is public transport also integrated? I accept that MyMove gets in touch with me regarding news and other promotions. Thank you for applying to use MyMove. Our planet is precious to us. Taking care of it whilst keeping seamless mobility is and will always be a challenge. This starts with your company fleet. Corporate Social Responsibility is an important topic and we think that mobility is a key area to address. Thanks to a defined mobility budget and growing concern about ecology, we believe that employees will start to unite around clean alternatives. The “company car” concept is coming to an end. My Move is the smart alternative to replace it. Our mission is to reduce the use of cars in companies in favour of alternative transport including electric bikes, e-scooters and electric motorcycles by creating a responsible community of people within companies aligned on the same mission. By owning a diverse fleet of vehicles, you let your employees choose the right vehicle to use at the right moment.